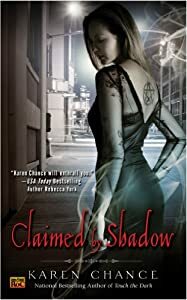 We have with us today, Karen Chance, author of two extremely enjoyable fantasy series that I count among my personal favorites: the CASSANDRA PALMER and DORINA BASARAB series. 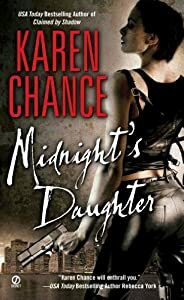 Karen has graciously agreed to stop by throughout the day to answer fan questions, and we’re giving away two more copies of Midnight’s Daughter the prequel to today’s newly released Death’s Mistress, so please make sure to comment or ask questions. SB Frank: First, can you confirm or deny that Santa Claus is indeed vampiric? Karen Chance: Right, and be put on the naughty list for good? I’m already there far too often as it is. Hm, good point. What does your husband or significant other, if any, have to say about all these vampire relationships you apparently have? Are there some vampires who he’s happy to see come around? Some vampires (eg: Santa Claus, as a random example) with whom he forbids you to relate at all? I don’t have a husband. And if I did, he wouldn’t forbid me to do anything, or the walking undead would be the least of his problems. My wife said something very similar to me recently, but in regards to remembering to do something or other, I forget exactly… What do you say to suspicions that some husbands have that vampires might be repeatedly mind wiping them every December? Is this an actual vampire ability? And are there long-term effects of repeated mind wipage? For instance, I notice that my friend frequently forgets where he puts things, and I (and he) are quite convinced this these memory lapses are ultimately somehow the fault of vampires. (Not that we’re bitter or anything). And what advice do you have for spouses (such as my friend) who suspect that their spouses may be having a side relationship with a vampire? Ask them for investment advice. Seriously, those suckers have hella stock portfolios. Well with the relationship advice out of the way, let’s turn to fantasy fiction. I recently had a chance to read an advance copy of Death’s Mistress, which is probably my favorite UF novel of the year. The mystery has a stunning ending. There is suspense throughout. The characters are original and fun. My only beef was I had to keep setting the book down because I was laughing too hard during the funny scenes to keep going… Like the part where headless Ray somehow ends up driving and knocks his own head under the car (long laughter pause)*wipes tears from eyes* heh heh. Anyway, I am praying that somebody picks up the option to make this series into a blockbuster movie. So, first question. Where do you come up with this stuff? Mostly it’s about the needs of the plot. All of my books have a mystery component. And when writing mysteries, it’s considered bad form (as in, the readers will kill you) if you don’t leave adequate clues along the way. But making these clues too obvious risks ruining the book for people who like to be surprised. So I use misdirection to keep anyone from noticing the more blatant clues being laid. Or, at least, that’s what I tell people. It’s also fun to do something outrageous now and then just for the hell of it. What does a typical day look like when you’re writing? Typical night, actually, since I’m barely conscious in daylight and certainly not creative at all before the sun goes down. Anyway, I never know how to answer these types of questions. The truth — I sit at a computer and make up lies–tends to put people off. It shatters the mystery somehow. I suppose I need to make up a good story about making up my stories, but I haven’t yet. Probably that whole laziness thing coming into play again. Has anybody started talking with you about movie rights yet? Ha ha ha, no. I don’t think too many people have even heard about the series, and I’m absolutely sure that Hollywood remains blissfully unaware. I understand (again, from your excellent website) that you lived and taught in Hong Kong. Did you enjoy living there? Any adventures to share or things that affected your writing? I liked a lot of the people I met in Hong Kong, but the city itself wasn’t really my thing. It’s huge, with something like 13 million people, and I’m more of a country girl at heart. I have to admit to feeling a little claustrophobic at times. I was also going thorough serious Tex Mex withdrawal, as it’s not a cuisine HK has chosen to embrace yet. As for adventures, there was that time a bunch of us were caught down by the docks with the diamonds and the four hundred crates of bootleg Ortega, but then, I’m not really allowed to talk about that. I lived in Tokyo myself for many years, and so I totally get where you’re coming from with the whole bootleg Ortega thing. I hear you have an advanced degree in History. Does that help you when Cassandra travels back in time? Or put differently, do you find yourself researching things you want to write about or writing about things you know from research? A little of both, I suppose. Anyone who suffers through a graduate degree has mountains of old notes lying around getting moldy, so it’s nice whenever I can find a way to utilize them for something. But it’s also great to be able to research a subject just because it’s interesting, something I rarely had the opportunity to do in university. Yes, my own dissertation was on the that famously scintillating topic: the retirement practices of Japanese bureaucrats. If you’re running out of moldy notes… No? Well, then, next question… Death’s Mistress (which releases today!!) is the second novel in the adventures of Dorina Basarab. Many characters repeat between the two series. But what I’m wondering is if you ever envision a novel-length adventure between the two protagonists. I’d like to answer your question, because it’s one that comes up pretty frequently. I also get asked when I’m going to do a full-length novel with Lia, the part werewolf character from my short stories, or Claire, one of the secondary characters in the MIDNIGHT DAUGHTER series of novels. But I have to tell you the same thing I tell everyone else: despite the common perception, authors decide exactly squat all about which books get published, when they are published and in what format. I get a little input on cover art and back cover copy (although I’m not allowed to write it) and occasionally marketing decides to use one of my titles. But that’s about it. So the only thing I can say about your question is that I do plan for the two to meet eventually, but I can’t promise anything about the format. You’ve had a fair number of short stories coming out in anthologies recently. Do you prefer writing short stories to novels? In your mind, what is the biggest difference to approaching a story versus a novel? I find short stories to be the hardest type of thing to write. In one tiny story, I have to fit all the aspects of a novel: plot, characterization, dialogue, world building, etc. I probably spend four times as long doing a short as I do writing a comparable number of pages in a novel, and I’m paid far less for it. I think my paycheck for the first short I ever did was something like $200, and it took me over two weeks to write. But the hope is always that someone will like what they read and go check out the novels. I suppose the main difference in my short stories and my novels is that the shorts have a single plotline and fewer characters. There’s no other choice, considering the length. This makes them a little more straightforward than the books, without as many layers. Also, unlike the novels, they aren’t really building on a large meta story, and don’t have to carry that burden. The strange thing is, I always really like my shorts when they’re finished and tend to be absurdly proud of them. Maybe because of the huge amount of effort that went into them. So, I suppose the answer to your question is, I like short stories fine — except when I’m writing one! Thanks, Karen! Readers, remember, Death’s Mistress, the second book in the DORINA BASARAB series releases today. And it was the most entertaining fantasy novel I read in all of 2009. If you are remotely interested in funny, thrilling, fantasy adventures that weave epic and contemporary elements into action-packed stories, then I highly recommend you buy it now!! Karen will be stopping by today to respond to comments and questions and we’ll be giving away two copies of book one in the series: Midnight’s Daughter, with winners announced on Thursday. FanLit thanks Stephen Frank for conducting this interview for us! STEPHEN (S.B.) FRANK, one of our guest contributors, earned a Ph.D. at Duke University and works in the field of education reform. When he needs a break from real life, he likes to indulge in urban fantasy. He has a particular love for humor, so some of his favorite authors are Dakota Cassidy, Mary Janice Davidson, Mark Henry, Julie Kenner, Katie MacAlister, Richelle Mead and Christopher Moore. Hey Karen, what has been your favorite read of 2009? I love your work. I started the Cassandra Palmer series at Embrace the Night and I’ve been dying for more. I’m so excited about Curse the Dawn! Quick question, how long or how many manuscripts did you write before landing an agent? Is it difficult to balance a good mystery with fantasy/horror elements? I loved Midnight’s Daughter and cannot wait to read Death’s Mistress. I am also a big fan of the Cassy Palmer series. I love that they are set in the same world. Do you see the stories coming together at all? Will Dorina and Cassie every meet? Love the interview thanks a bunch for coming by. I’ve not yet had the opportunity to read your work…so which one should I start with? Cassandra Palmer or Dorina Basarab? Is there a fundamental difference in the type of story you are telling with each character? I absolutely love the Cassandra Palmer series and the Lia de Croisset short stories. I am very excited to start reading the Dorina Basarab series. I do hope there are more to come because I can’t get enough. WickedLilPixie: I read pretty eclectically, and there were some great books out in 2009, so that’s a hard question. But in UF, I’d have to go with Bone Crossed by Patty Briggs. It doesn’t need another plug, but it’s a great book in a great series. Lisa: Thanks, and I hope you enjoy CTD. As for your question, I didn’t have an agent for my first three novels. I had approached some at the same time that I was sending the first book, Touch the Dark, off to publishers, but none were too impressed. In fact, for a year or so after the book sold, I was still receiving letters from agents informing me regretfully that, in their opinion, it was simply not marketable! Luckily, several editors thought otherwise, but that’s why I always tell people not to assume that you need an agent for a first sale. It’s nice if you can get one, but plenty of us sold off the dreaded slush pile and are doing okay. Mike: No, not really. A good mystery is a good mystery, whatever elements make it up. You just have be certain to not to use one of the deus ex machina endings just because it’s fantasy. The rules of your world have to be solid and the mystery has to fit within those rules. In other words, you have to play fair with the reader. Melanie: Thanks, and I’m glad you’re enjoying the books! I’d say there’s a distinct possibility that Dory and Cassie may eventually meet up, although I can’t give you more details than that. Sorry! Justin: The series are both set in the same world, so they overlap to a degree. But the Dory series might be the place to start, as there are only two books out now as opposed to four for Cassie. It’s a little darker than the Cassie series and normally centers around a mystery plotline, whereas the Cassie books are slightly lighter in tone and have a more action/adventure feel. Either way you go, hope you enjoy them! Hi Karen! Loved the interview! I love your Cassandra Palmer series. And must say I haven’t started the Dorina Basarab series, but I’m looking forward to it. Who are you favorite authors, in any genre? Great interview and happy release day! 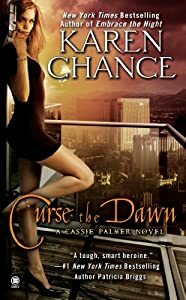 I haven’t read your Cassandra Palmer series…but it sounds really interesting and will definitely add it to my tbr list. I was wondering what are you currently reading, and which authors are on your ‘must buy’ list? Sounds like I need to go open a chain of Mexican restaurants in Asia. I’ve enjoyed your Cassandra Palmer series and I’m looking forward to starting this new series with Dorina. Do you envision any particular people (actors, models, etc) portraying your characters when you write? Sort of putting a face to the character so to speak. If so, who do you see for which characters? Amanda: Old school: Rex Stout, Agatha Christie, JRR Tolkien, Ellis Peters, Madeleine L’Engel and Colleen McCullough. New school: Lindsey Davis, Kelley Armstrong, Jim Butcher, Patricia Briggs, Charlaine Harris and Laurell K. Hamilton (esp. the early Anita Blake books). Kelley: Thanks! I hope you’ll enjoy the Dorina series as much. van_pham: It’s really hard to find the time to read as much as I’d like, but I jump on anything the authors above write as soon as it comes out. Daelith: No, I’ve never based a character on a real person, famous or otherwise. If I did, I’m afraid I’d become too attached and that could be a problem when the plot requires bad things to happen to them! However, some of the people who comment on the forums on my web site have come up with a long list of actors and models for almost every character, and it’s always interesting to see how people’s opinions differ. Great interview! I have not read this series yet but I definitely plan to. What are some of your favorite books? Hi Karen, will Mircea tell Cassie about Dorina anytime soon? Make sure to pick up Inked too. Two of my favorite of Karen’s characters are featured in her story. I’d love to win the first Dorina book. I’ve been wanting to start this series since it came out. I almost picked this book up the other day, then I realized it is the second in the series. I want to read the first book before I read this one. So I will have to back track and find the first book at one of my local stores then go to this one as well. It is great you came here for an interview. I am glad you are honest with you answers. I am sure many authors are, but in these interviews I start to get the feel that you are really normal people just like us readers. Thanks again! I’ve been loving the Cassie Palmer series. I’ve heard good things about the Dorina Basarab 1st book and I’m really looking forward to reading this series. Thanks for the great work! I’ve never read Karen’s books before! I really need to win so I can start them..
Great interview. I’ve never encountered your books before but I will have to make sure I do in the future. How does someone who is ‘a country girl at heart’ end up writing Urban Fantasy? Excellent interview with Karen Chance! Thank you to Karen for sharing & for answering the comments. Here’s to an excellent 2010! Karen has certainly been very open in her interview. It is always good to find out a bit more abouth an author. Best of luck with your series in the future. congrats on the new release and I must say I absolutely loved both cassie and Dorina. Can’t wait to read this one too. Great interview. Your Dorina Basarab series sounds good. I love your Cassandra Palmer series. Very interesting. Looking forward to checking it out. I’ve heard some fantastic things about your series. I can’t wait to read them. When did you decide on writing this type of fiction? Great interview!!! I was wondering what you like to do in your free time. Karen Chance! I love this woman’s work. 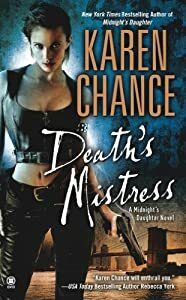 I can’t wait to get started on Death’s Mistress because the Cassandra Palmer series is one of my favorites! Thank you for the great reads, crossing my fingers for this contest! Hi Karen, loved the interview and you are tooo funny! !